There were many Creative products released at 2011 IFA Berlin. 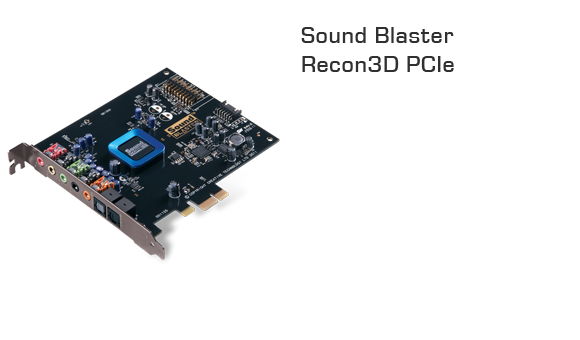 Its the Sound Blaster Recon3D Sound Cards. This is a new gen of the Creative Sound Blasters. It seems that it will replace the current X-Fi Sound Blaster series. With the THX TruStudio Pro as the new standard for the Sound Blaster Recon3D series. SINGAPORE - 1 September 2011 - Creative Technology Ltd today announced its Sound Blaster® Recon3D audio platform and sound cards, powered by the groundbreaking new Creative Sound Core3D quad-core sound and voice processor. Designed to deliver hardware-accelerated THX TruStudio Pro™ and CrystalVoice™ audio technologies for games, music and movies, the new series of Sound Blaster Recon3D sound cards will be previewed from 2-7 September at the 2011 IFA Berlin, at the Creative stand 111, Hall 17, Messe Berlin. The stunning audio and voice performance of the Sound Blaster Recon3D sound cards is powered by Creative's new Sound Core3D, the world's first quad-core sound and voice processor. Designed by Creative's in-house team of audio scientists and engineers, Sound Core3D is engineered for low power consumption and high performance. It incorporates Creative's innovative patented Quartet digital signal processor (DSP) with four independent processor cores, and is the first processor to integrate an array of DSP cores with high-quality HD audio codecs of over 100dB on a single chip, giving it tremendous versatility for PC and embedded configurations. 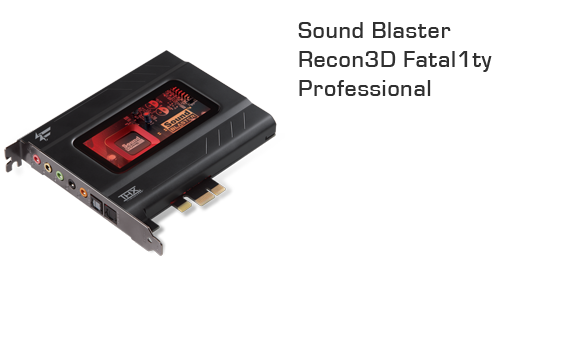 Immediately recognizable by its stunning design and glowing red Creative Sound Core3D processor, the Sound Blaster Recon3D Fatal1ty Champion sound card provides hardware-accelerated THX TruStudio Pro audio technologies for unparalleled audio playback quality. The Sound Blaster Recon3D Fatal1ty Champion includes a convenient and cool-looking I/O drive with headset mini-jacks, volume control and audio input connectivity options. The card also includes a high-quality beam-forming microphone, which leverages CrystalVoice Echo Cancellation, CrystalVoice Focus and CrystalVoice Active Noise Reduction to enable gamers for the first time ever to use speakers and a desktop microphone while gaming without any sound other than the gamer's voice being transmitted through the microphone. Designed to deliver crystal clear vocal fidelity in multiplayer games, online chats and video conferencing, CrystalVoice technologies also provide a compelling voice communications option for VOIP solutions such as Skype. The Sound Blaster Recon3D Fata1ity Champion software enables quick and easy switching between multi-channel speaker settings and headsets or headphones. The card is slated for availability in Q1 of 2012. Designed with the same powerful THX TruStudio Pro and CrystalVoice audio technologies of the Sound Blaster Recon3D Fatal1ty Champion, the Sound Blaster Recon3D Fatal1ty Professional sound card features I/O connectivity on the sound card itself, for users who don't wish to use an I/O drive. This card also includes the high-quality beam-forming microphone, allowing advanced voice communication without the need for the headset by leveraging CrystalVoice Echo Cancellation, CrystalVoice Focus and CrystalVoice Active Noise Reduction.